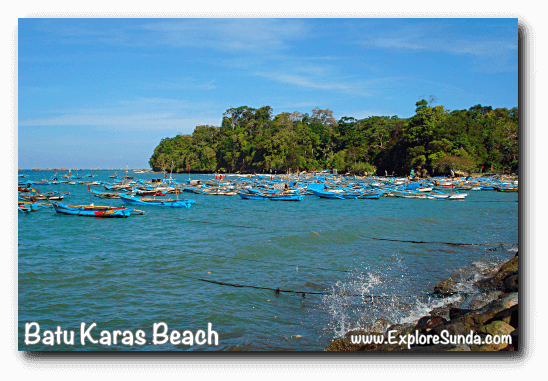 Several years had passed since I visited Batu Karas beach and voila: it now has developed into a small tourist village. It used to be a quiet fishermen village, thus, the first thing we will see here are the many small fishermen boats anchored in the shallow water or landed on the shore. Then, further down the road there is a cove with wide sandy beach where we can truly enjoy the beach. 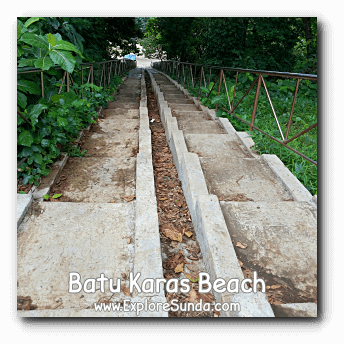 One way or another, Batu Karas will always remind us of Pangandaran. It looks a lot like a smaller version of Pangandaran beach. Similar to Pangandaran, it lays on a small cove, so the waves are relatively safe, although it faces the Indonesia / Indian Ocean, which is famous for its strong current. Another similarity is the road that separates the beach from other properties, such as hotels, public wash room, and parking lots. 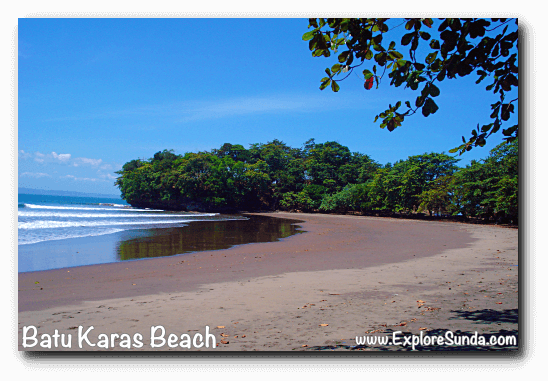 Batu Karas has a wide sandy beach lined with big trees, which provide plenty of shades. It is a great place for picnic. Don't worry if you are not prepared, there are many vendors who will approach us to rent a picnic mat. These mats are favorite rental items because unlike Pangandaran, not so many visitors spend a night in Batu Karas. Most of them spend several hours playing on the beach, then go home or stay in Pangandaran. Hence, picnic mats and public wash rooms are essentials on this beach. First, you may want to see the view from above. There is a hill at the end of the beach. We only need to climb sixty so stairs to reach the top. There you can see waves break at the bottom of the cliff. It has a beautiful view and several selfie spots. However, you must be extra careful, since there is no fence to keep you away from the edge. The only drawback is there are so many trashes on the ground, mostly are the food and drink containers people throw away carelessly. 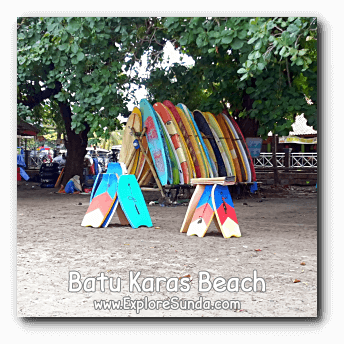 Many people love to go to Batu Karas for surfing, some bring their own surf board, but you can always rent it on the spot. Alternatively, rent a boogie board and do body surf in the shallow water. But if you prefer the old fashioned way, use the truck's inner tube to float against the wave. It has been available for rent since forever, but they are becoming less and less popular when people prefer to rent boogie boards. 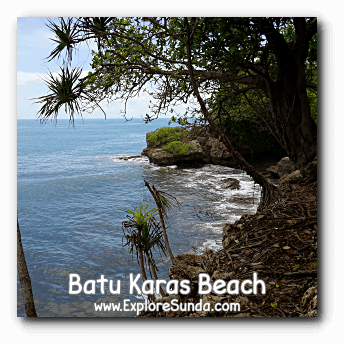 The more the merrier also applies when visiting Batu Karas. If you come in a group, go have fun riding the banana boat or donut. Just be prepared to be flipped at the end of the ride ;-) Then, you can have fun playing volley beach and football on the shore. If you plan to spend a night or two in this beach, you'd better take some time to do research on where you want to stay. There are many different types of accommodations offered here, ranging from 3 star hotels to locals' homes. 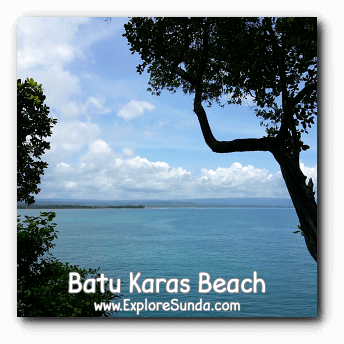 The best location is surely the ones facing the beach, although there are no private beach in Batu Karas. All of the properties, including the hotels, are across the street from the beach. The only problem we face during our stay in Batu Karas is the availability of decent restaurants. Unlike Pangandaran, good restaurants are hard to find here. The easiest to find are street vendors selling instant noodles, steamed corn, etc. Even some restaurants in the hotels only offer fried rice in their menu. Located 33 kilometers west of Pangandaran, it takes approximately one hour drive to reach the beach. But, if you fly in to Nusawiru airport, which lays between these two beaches, it takes less than 30 minutes drive to Batu Karas. 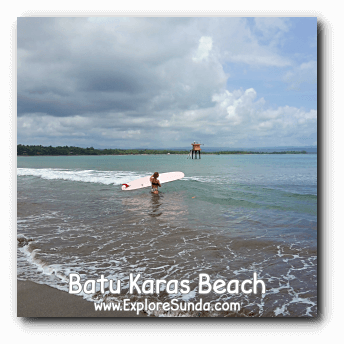 Thus, this article on Three Best Options To Go To Pangandaran Beach will be useful when you plan to go to Batu Karas. More people visit the beach on weekends and holidays. The peak seasons occur during the Eid al-Fitr, Christmas and New Year holiday, which usually coincide with school holidays, i.e. around June until July and December. 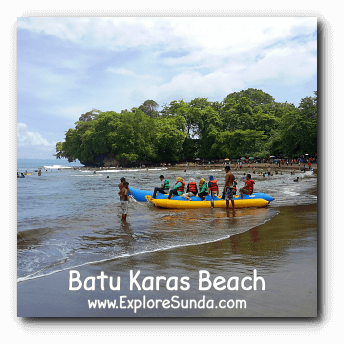 If you plan to visit Batu Karas during a peak season, make sure you already secure your accommodations, either here or in Pangandaran, and prepare yourself for traffic jams and long queue in restaurants. 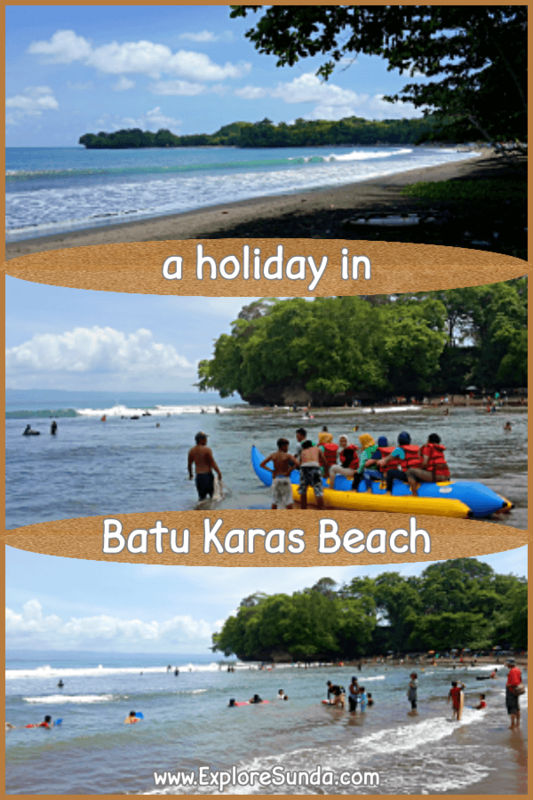 Presently, we have to pay ticket for every beach we visit in the area of Pangandaran district. So, if you only to visit Batu Karas, make sure you don't pass Pangandaran beach gate, otherwise you will have to pay ticket for both beaches. The ticket is valid for the duration of your stay. The ticket is not expensive if you use public transportation, but if you ride a motorcycle or private cars then the price is escalated. The ticket price is based on the type of car you use instead of how many persons inside the car. Last but not least, if you use a car, the parking fee is included in the ticket price as long as you park it inside the provided parking lot. Otherwise, you will have to pay extra parking fee to the locals.